What Exactly is Jailbreaking and Do I Need To Be Incarcerated To Do It? The term sounds pretty cool, right? It conjures up imagery of having a slew of gadgets up your sleeve that will allow you to crack open the doors of your prison cell and give the security guards the old slip as you escape to freedom. It certainly reminds me of the movie, The Shawshank Redemption. Well, in a way, you’re not too far off. Jailbreaking is nothing more than removing the limitations imposed by phone manufacturers to allow you to get full access to the operating system to make modifications that would otherwise not be possible. Jailbreaking is routinely done on Apple’s line of mobile products including the iPod Touch, iPhone, iPad. By doing so, you can install and use third party applications that have not been officially approved by Apple. For those of you not completely sure about jailbreaking, it is worth noting that this practice is NOT illegal and has been ruled by the US Courts that it does not violate the 2009 DMCA (Digital Millennium Copyright Act). Essentially, what jailbreaking allows you to do is to have access to both sets of files on the Apple devices: the first one, called the Private Drive, is the main Application disk that you already have access to and holds all of your music, contact information, etc. The smaller disk, called the System Drive, contains the iOS itself. This second file system is what is not immediately available to you when you purchase any of the above listed Apple devices. By downloading Jailbreaking applications like Cydia, this operating system file becomes available and that is how users can modify it to start using third party applications. In addition to being able to use third party applications, Jailbreaking also allows you to use another cellular network. This way, if you don’t have an account with AT&T or Verizon, then you can still use the iPhone on T-Mobile, Sprint, or one of the many other networks that you may have a contract with. However, Jailbreaking is not a trivial matter just as it isn’t a trifle matter to jail break out of a federal penitentiary (though jailbreaking an iPhone is far easier). There are a number of steps that should be performed in order to properly jailbreak the device and make it usable. The good thing is that you can always reset your device back to its factory settings in case the jailbreak doesn’t work, or you need to return the device to Apple while it is under warranty, as Apple will not accept any jailbroken devices. The best place to start getting information on jailbreaking or actually doing it, is to start searching for videos on Youtube. A lot of contributors have uploaded some good videos on downloading the Cydia software and then following the instructions on setting up the Cydia software. To download the Cydia application, you can open up your Safari browser directly on your iPad, iPhone, or iPod Touch and go to www.jailbreakme.com and get started from there. Back in 2008 when I was following the Democratic Presidential Primaries and saw how Barack Obama was winning a string of primaries and Caucuses in state after state against his rivals, a political commentator on CNN said that one of the reasons Candidate Obama continues to win is because he is winning. While this may sound like circuitous thinking, there is a certain logic to this. Even in my own life, I’ve noticed that if things are going along pretty well, I’m going try just that much harder to make sure that I stay ahead. It’s almost like a self-driven inertia. The same thing seems to be happening right now in the various operating systems that run mobile smartphones. The players that started on a down streak a year ago, are still falling in their market share. 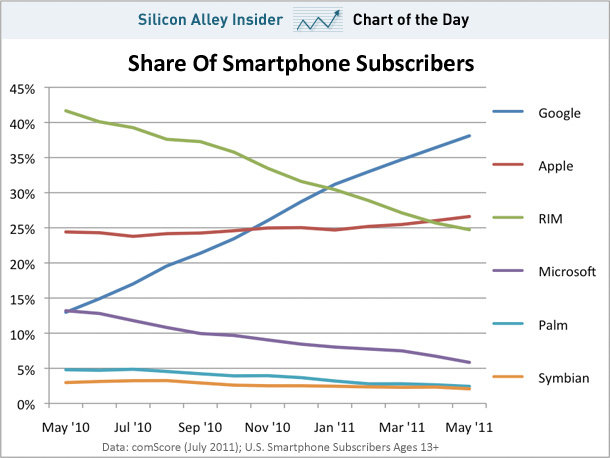 And the one OS that was rising a year ago, Android, has been tearing up the track since then for the US market share. It’s no surprise that Google’s Android was going to be a huge player in the mobile handset world when it was first released in November 2007, but its dominance over the other well established players in the smartphone market is quite a feat, as the chart below shows. It should be pointed out, however, that this chart is only for the US Smartphone market, and not the overall mobile handset world market. That would be a completely different set of numbers, as most mobile phones in the world today are still the basic and feature phones. So, is Google winning because it’s winning, like I had alluded to my earlier analogy? Yes, it is. But even when Android was the new kid on the block, it still had everyone’s attention. It’s pedigree is just too prominent to ignore. Some giants fall quickly, others go down trashing about in the water for years before they either drown or get swallowed up by a really big fish. Nokia happens to be a hybrid here- they are doing both. Not only have they lost sizable market shares quarter after quarter and year after year, but they may also be looking for a lifeline to be bought out. What happened here? I think it’s the case of a myopic CEO – actually two of them back to back. Everyone who follows the mobile industry knows that Nokia has decided to drop its Symbian mobile operating system and has hitch its wagon with Microsoft’s Window’s Phone 7 (WP7) software. Dropping Symbian was a no-brainer. Back in 2008, I was involved in a bunch of meetings with Nokia Forum and the business managers were asking members of its development community, including myself, what it could do to make things better. A number of suggestions were made, and some of them were adopted, but at the end of the day it was clear that Symbian had to go. At best it was a clunky operating system and was built around the phones. It was never set up to be a stand alone software that developers could use to create apps, like iOS or Android. The decision to move to WP7 is work of the current CEO, Stephen Elop, who, by the way, is an ex-Microsoft executive and led the MS Office business during his tenure while in Redmond. When he stood in front of the Nokia employees this past March and told them that he was unable to cement a deal with Google’s Android for certain exclusivity rights or advantages against other competitors and they would be moving forward with WP7, Nokia suddenly found itself following a very different path. Symbian’s original replacement, MeeGo, the Linux based open sourced operating system that Nokia was working in partnership with Intel with, was also thrown off the bus because its development time was far too slow. In fact, based on the road map, only three phones employing the MeeGo OS would be released by 2014. The previous CEO, Olli-Pecka Kallasvuo who left in September of 2010, never really took the rise of either Apple’s iPhone or the Android OS, as a real threat when they entered the market and never pushed his company to aggressively counter it. Such is the folly of sitting on your laurels. So, now that Nokia is in the predicament that it’s in, they are left with either the Android or the Windows bandwagon to jump onto. Why Nokia decided that it needed some exclusivity with Android is beyond me. Samsung is in a solid second place with handset sales and is gaining rapidly on Nokia. They use Android, and have been quite successful. By comparison, only 4 million devices use WP7 as of Q2 2011 and even the fading Symbian OS is 100 times its volume worldwide in 2010 shipments alone. How far has Nokia fallen? Well, in 2007 Nokia commanded 50.8% of the smartphone market. Today, they are down to 25% for Q1 2011. In the meantime, the number of smart phone sales have increased year after year. As a result, Nokia has lost 75% of its market capitalization and is potentially situated in the cross hairs of a possible buy out. In its strategy to turn things around, Nokia will be focusing on the lower end market. These are still huge sellers in developing nations in Asia and Africa. However, Chinese and Taiwanese firms are hammering Nokia’s margins with inexpensive offerings of their own. Why just manufacture a board that goes into a phone, when you can make the whole thing and go straight to the consumer. So, while Nokia won’t be going away anytime soon, it is in the fight for it’s life. They haven’t made any good decisions in quite some time. Even if the next dozen strategic decisions are the right ones, how much will they really recover, if at all. For the short term, they will undoubtedly lose more market share. For the long term, luck will have to play a pretty significant part. After years of maintaining a fairly benign stand on the risks of cell phone radiation exposure, the International Agency for Research on Cancer (IARC), which is an arm of the Who Health Organization (WHO) has reversed its course on the dangers of said radiation to human health. According to their recent statement, the team of 31 scientists from 14 countries at the IARC that have been researching the effects of mobile phones now say that it could be “possibly carcinogenic to humans”. Though this is certainly a serious concern in terms of long term human health, especially now that over half the human race walks around with mobile phones in their pockets and purses, I’d be curious to know a bit more information about it. First off, the word “possibly” from the above quote leaves me with a lot of ambiguity. There are lots of things that can “possibly” cause cancer including the microwave ovens, x-rays, smoking, our sun, and a host of other items. The question really comes down to exposure. There are two main factors that will account for that. The first one is the actual amount of radiation each type of phone releases. This is given in Watts per kilogram (W/kg) and the Federal Communications Commission (FCC) has established a maximum Specific Absorption Rate (SAR) as 1.6 W/kg. As it turns out, lots of today’s smart phones approach that limit. You can find a fairly comprehensive list of these levels from the Environmental Working Group here. The second factor is duration of exposure. That is a bit more difficult to determine since there are so many environmental factors that feed into this. The age at which a person begins using mobile phones is one of them. Children, who have thinner skulls than adults, are susceptible to greater amounts of radiation penetrating into their brains and could have a higher chance of developing various types of tumors at a faster rate than people who began using mobile phones as adults. Just like with any other carcinogen, the effects of cell phone radiation will differ from person to person. Depending on both level to exposure and amount of the exposure, some people may develop symptoms in as little as ten years. Others may go an entire lifetime without seeing any adverse effects to their health. But, I believe its always better to err on the side of caution. There are already guidelines in limiting exposure to cell phone radiation. To begin with, use an earpiece that will get you further away from the “guts” of the phone where the transmitter sits. Even when using a mobile phone up to your ear, try to keep it at least an inch away from your ears and face. When calling isn’t necessary, text the recipient instead. Undoubtedly, more information will be coming out regarding this issue in the months and years ahead. As with most health studies, the claims released this week will be modified, refined, or may even be reversed. Such is the way with science. Our final push for the South Rim and civilization is today. We actually rose a bit earlier than expected due to our neighbors in the camp site next to us – a fairly excitable co-ed group of college students who were also backpacking through the canyon as we were. So, instead of waking up at 6, we were up at 5:30 on a fairly overcast morning. The wind had blown in gusts throughout the night, and there may even have been a few drops of rain that fell but looking around the campsite, nothing looked damp, so I couldn’t be sure. The college troupe took off on the trail to the rim about 25 minutes before we did as we broke down our camp, brushed our teeth, and had some bars and electrolytes for breakfast. At 6:15 AM, we left Indian Garden’s Campground behind us and started for the South Rim ourselves. 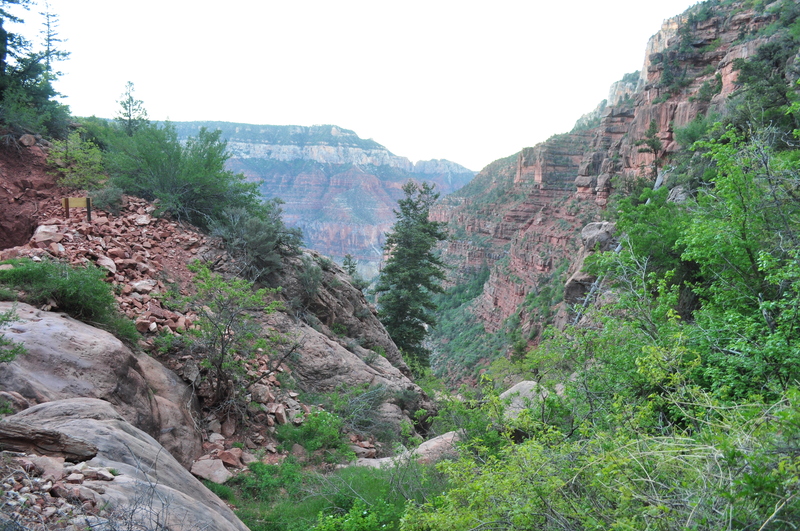 Leaving the campground area behind the the canyon really opens up from here on out. We start noticing the massive buttes and towering cliffs that rise to make the South Rim ridge all around us. The clouds also parted and we were exposed to the sun fairly quickly as we continued our climb. From the campsite, there is only 4.6 miles left to go on the Bright Angel Trail to reach the rim. Other than Friday night when we only came 1.7 miles down, this would be our shortest hike in terms of distance. On the other hand, the rim was also 3060 feet above us. So even though this last part has the greatest elevation to climb out of, there are a few distinct advantages that helps to offset the sizable elevation gain. 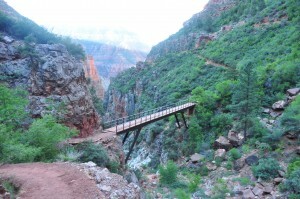 For one, this part of the trail from the South Rim to Indian Gardens is the most heavily traveled path in the Grand Canyon National Park. As a result, there are many more hikers to talk to and see in either direction. The second advantage is that this section is broken up almost in thirds with water and restroom facilities to help out. So once we left the campsite, the near term goal was to get to the first one called the Three-mile Resthouse (being three miles from the South Rim). From there, another hour gets you to the Mile-and-a-half Resthouse, and then the final push to the rim. By the time we got to the Three-mile Resthouse, the college group that left before us in the morning were still there. They weren’t going as fast as we expected they would be. We spent about 20 minutes resting after the fairly steep climb to this point and then passed them up on our way to the next resthouse. We also passed several other backpackers on our way up, making me think that we were actually making pretty good time despite all the gear we were carrying. Of course, we were still being spanked by most (but not all) of the day hikers as they made their way back up to the top with just a bottle of water. It was at this point that I started thinking about those superheroes, and how the porters and sherpas of the world embody some of those superhuman traits that I spoke of in the Day 1 page of this trip blog. 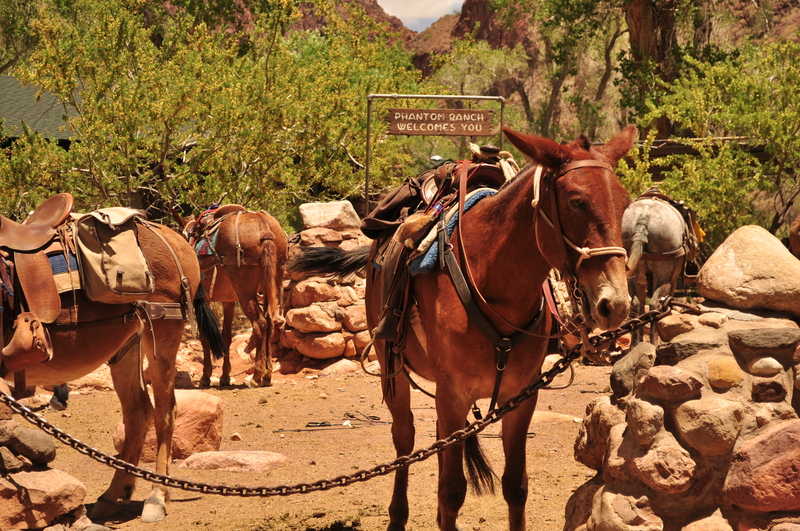 I was rattled out of that thought about a half mile past the Three-mile Resthouse when a pack of mules carrying guests came down the trail on their way to Phantom Ranch. There were about a dozen in all and would cover a total distance of 9.6 miles in about 5 hours. I know this because I asked the guide as he passed me up. If I ever come back to the canyon again, I think I want to try this. It seems like one of the few things I haven’t done in this part of the Grand Canyon. Another twenty-some minute rest once we reached the Mile-and-a-half Resthouse brought us to the last leg of our Rim-to-Rim hike. There are a couple more landmarks here in the final stretch: two tunnels that have been dynamited out of the Coconino Sandstone and is similar to the Supai tunnel on the North Kaibab trail. The first one is the Bright Angel Tunnel about a three quarters of a mile from the top. The second one is much closer to the rim much more rectangular in shape. I forget the name of it, though I’m pretty sure it does have one. From here on, it’s pretty much a jaunt to the top. 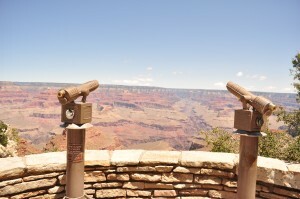 Voices can be heard by the visitors walking around the rim and observation areas. 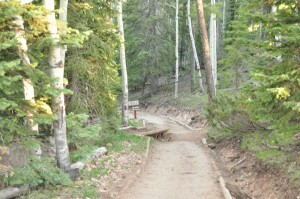 The trail is much more crowded as day hikers make their way down to the first or second rest house. 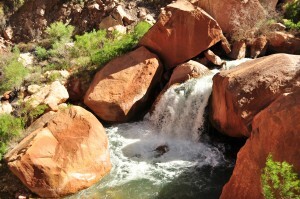 I accelerated my pace here and arrived at the Rim at 10:14 AM on Memorial Day, May 30, 2011. 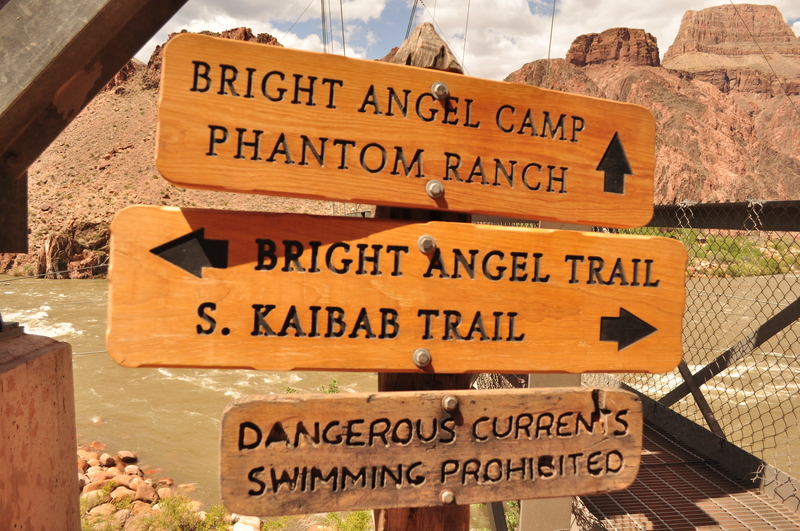 The Bright Angel Trail begins (or ends, depending your direction) at the Kolb Art Studio, a Victorian-style building built by the Kolb brothers in 1904 and has served as a photography workshop and studio since. I waited about 15 minutes for my brother to climb out behind me and join me at the rim. It was a beautiful morning and the temperature at 6860 feet up was in the mid 70s. We did the entire journey in about 63 hours and 20 minutes from trail in to trail out. At Last - The South Rim Summit!!! Fortunately, I had found a place to park the car just 20 yards from the trail head when we first arrived here on Friday morning. So we were able to quickly throw our bags and gear in there, pull out a fresh set of clothes and headed into the Bright Angel Lodge to wash up and change. Following that, a quick stop off in the souvenir store had us purchasing the “I Hiked the Rim to Rim Trail” t-shirts. One final look and a few more pictures later, we jumped into the rental car and made the 90 minute drive back to Flagstaff. Overall, we were tired and sore, but feeling pretty good. The blisters in my feet would heal in a few days, but it was nothing to worry about. All in all, a nice adventure on one of the must-do hikes in the world. Back in Flagstaff, we still had several hours before our flight to Phoenix and then our connecting flights back home to California. 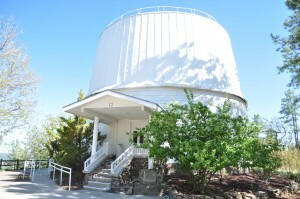 So to spend the few hours we had left, we took a quick trip to the famous Lowell Observatory. 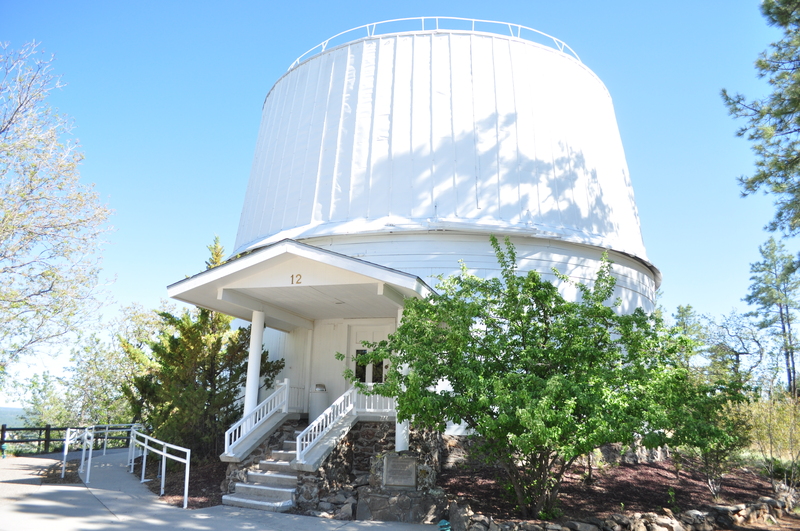 This world famous astronomical observatory was established in 1894 by Percival Lowell, who spent a significant amount of his time studying the planet Mars. He was fairly convinced that he observed a large number of “canals” on the planet which could have been proof of an intelligent life inhabiting the planet. Naturally, this is not the case and the canals have been proven to be nothing more than an optical illusion, due in part, to the poorer quality of telescopes used in the 18th and 19th centuries. The other notable highlight regarding Lowell Observatory was the discovery of the dwarf planet Pluto by Clyde Tombaugh in 1930. After a few hours here, we headed to the airport, returned the car, and caught our flights home. No sooner had I taken off was I already thinking about my next backpacking excursion. Finally, listed below are a few pieces of advice and hints that may prove to be useful for other would be Rim-to-Rim backpackers. 1. You must have a backcountry permit. The only way to get one is from the National Park Service. Here is the link for the permit request form. Fill it out as soon as possible so that the dates you want are still available. 2. We did our backpacking trip in four days. We started as soon as the shuttle dropped us off on Friday evening and climbed out on Monday morning. I would certainly recommend one additional day. Starting immediately did prevent us from checking out the North Rim and made our first full day of hiking quite long for a backpacking trip. 3. Hiking sticks! Even if you have strong legs and great knees, they are indispensable for a terrain such as this. I would say that hiking sticks are more important on the steep downhill trails than on the uphills, but they help tremendously in both cases. I probably would have had a lot more blisters if it weren’t for the hiking stick I was using. If you purchase one, make sure you get the diamond tip ones. The hiking sticks will get battered on the rocks, gravel, and dirt. 4. Logistics. This is not an easy trip to plan. 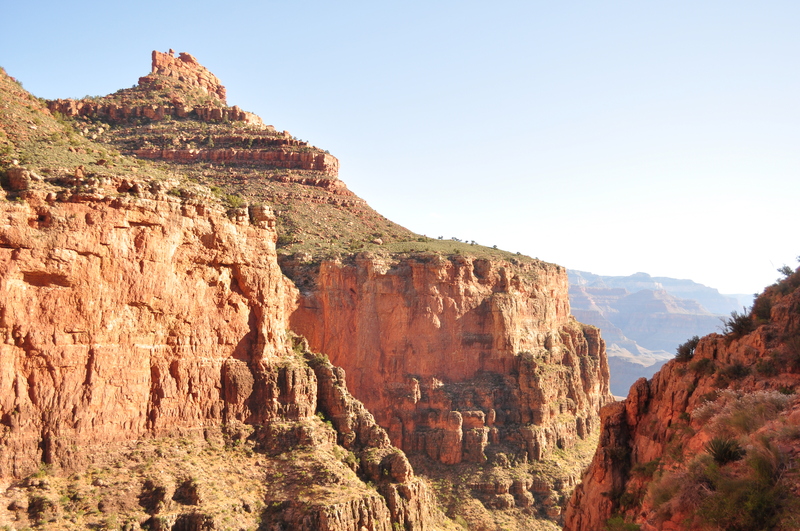 Even though the North Rim at the end of North Kaibab Trail is only 10 miles as the crow flies, it is about 24 miles by trail, and 220 miles by vehicle. So, unless you want to get to the South Rim and then turn around and hike all the way back to the North Rim, get a ride secured. The best way to do this is to use the Trans Canyon Shuttle. 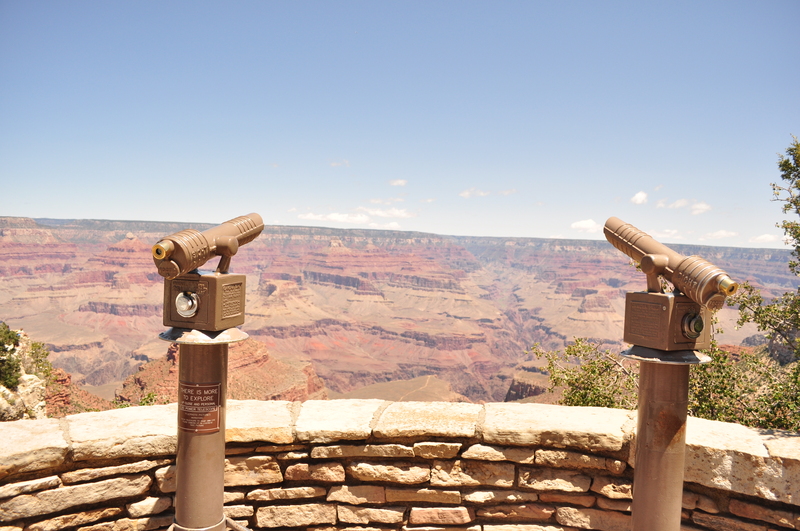 They have regular service from the South Rim to the North Rim at 1:30 PM. 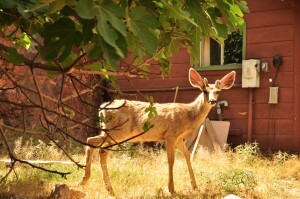 Also, if you’re going the other way, their North Rim shuttles leave at 7:00 AM. Call a few weeks ahead of time, book your ride and pay the 50% down payment by check to secure the slot for your party. 5. Electrolytes. Water is a must, but electrolytes are very important too for your body to maintain its ability to function properly at the cellular level. 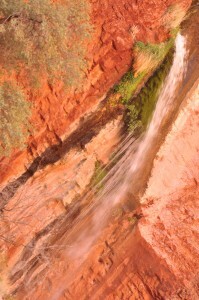 You will sweat out a lot of electrolytes here in the Canyon, and it is necessary to keep it replenished. We used electrolyte tablets that we added to our water. I used Nuun tablets that I purchased at REI. Since water was the only thing we had to drink, it was also good to have a nice change in flavor every once in a while. 6. Keeping Cool. 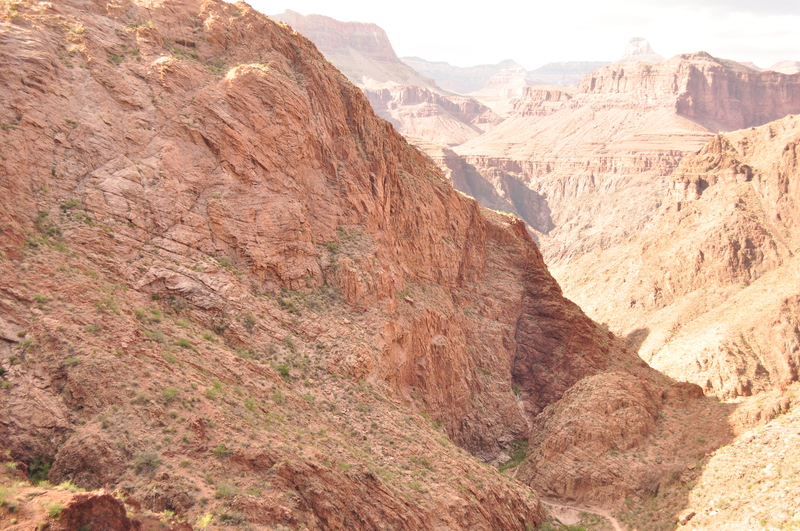 It shouldn’t be a surprise to anyone that the Grand Canyon gets hot, really hot. Other than wearing a hat to keep the sun off your face and sun tan lotion to keep from frying, I would recommend a bandanna. Whenever you see a water source, wet your bandanna and tie it loosely around your neck. Depending on the heat and low humidity, it will dry pretty quickly. However, its still a great way to help regulate your body temperature and keep from overheating. Have a great trip. As long as you’re properly prepared mentally and logistically, it should be a fantastic experience and one you soon won’t forget. The plan for this day was to get up early and hike up to the next campground at Indian Gardens before lunchtime, spend the mid afternoon resting, and then take an easy hike out to Plateau Point around sunset. 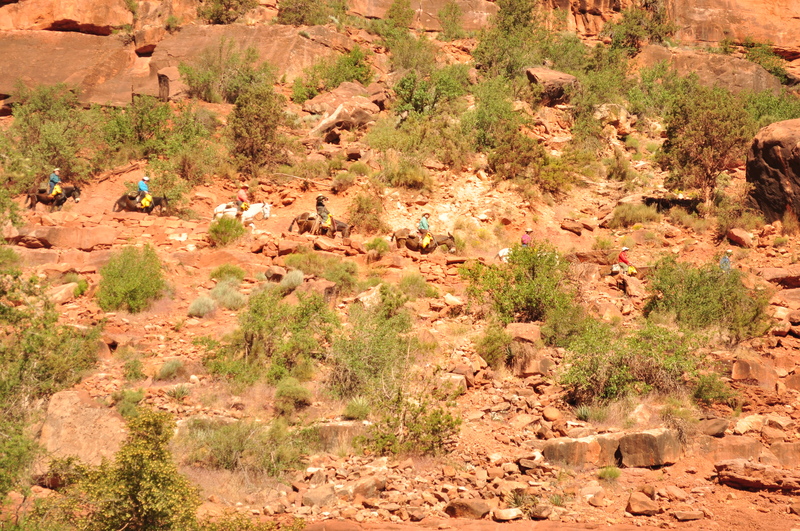 However, we were pretty exhausted when the morning came and decided to take it easy for the first part of the day and take in the sights and sounds around Phantom Ranch. Now that we had settled upon the lazy way out, we didn’t actually wake up until just before 9 AM with the sun started hitting us pretty hard. 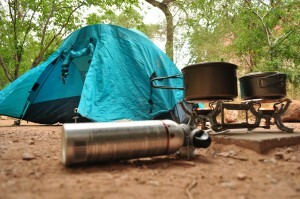 By this time, many of the other campers had already left the campground. Since we had just thrown our tent into the first open spot the night before, we realized that we didn’t get a spot with any shade. So, without taking down the tent, we simply moved it to an adjacent spot right next to the Bright Angel Creek and rested some more. For breakfast, I had a failed attempt at making buttermilk pancakes using another one of the backcountry meals. The reason for this, I believe, is because I didn’t have a skillet, and pancake is pretty hard to make in a pot. I guess that was the first meal failure of the trip. So, we reached back into our trusty bag of protein bars and electrolyte tablets to fill us up. Around this time, 10 AM or so, the same group from Texas we had met at Cottonwood Camp the day before strode in and asked if they could hang with us again. It was nice to see them again, so no worries. They set up shop and we shared some more stories of the past 18 hours since we had last seen them. Following this, I decided to cool off my feet in the creek which would help with the half dozen blisters I had gotten the day before. So, I spent about 45 minutes sitting with my feet soaking in the cold current of the Bright Angel Trail. It actually made a really big difference and my feet felt so much better afterwards. Following that, I did some photography between the campground and Phantom Ranch and then spent about an hour in the canteen just hanging out and talking to a few other thru-hikers. I also spent this time writing a few postcards to friends that would be carried out of the canyon by mule to the National Park Post Office and then on to their destinations. With the early afternoon approaching, we packed up our tent and gear, tapped off on the water in our reservoirs and headed up to Indian Gardens at 3:07 PM. The distance we had to cover here was 4.7 miles and only 1320 feet above us. So, we said good-bye one last time to our friends from Texas and headed out. 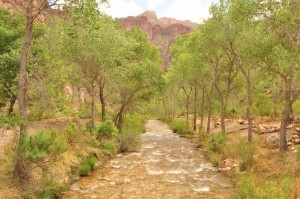 The Colorado River was less than a half mile away from our campground. 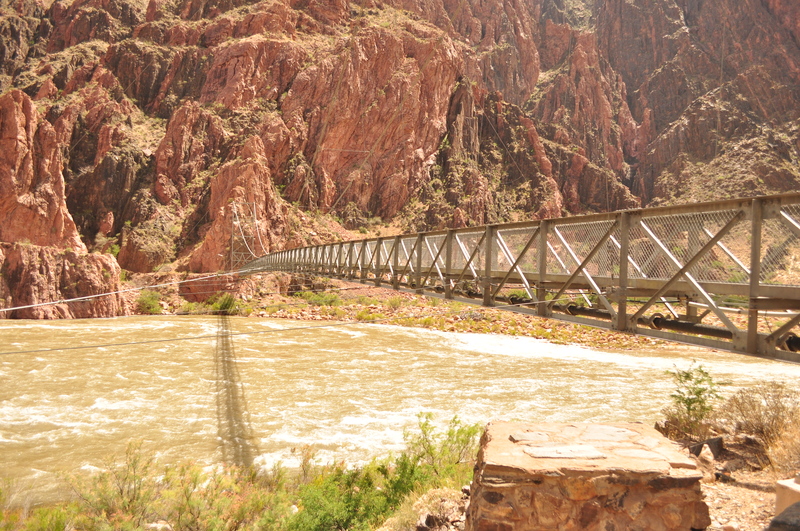 Once there, we crossed the Silver Bridge which would connect with the Bright Angel Trail and was a few hundred yards west of the Black Bridge that went onto the South Kaibab Trail. 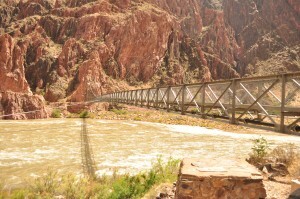 From here, the trail turned west and went along the Colorado River for just over a mile until it hit the River Resthouse. 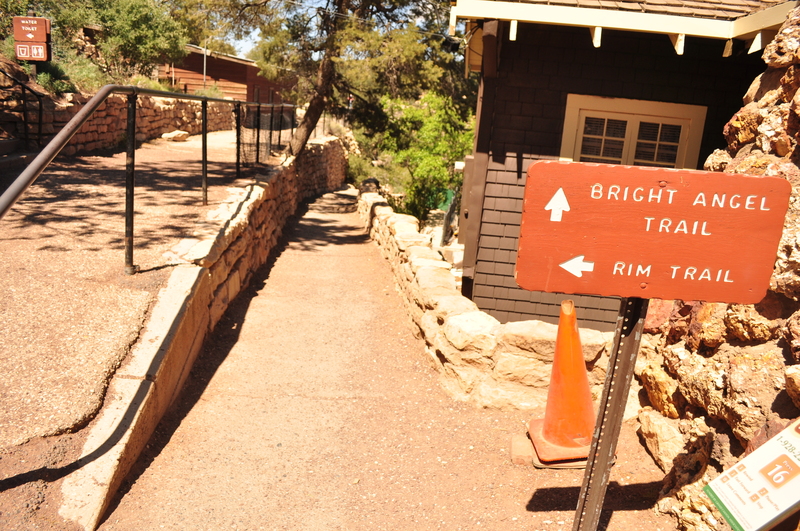 According to the trail guide, the rest-house is at the same elevation as Phantom Ranch (2480 feet), so the expectation was that this would be a pretty flat hike. Au contraire! The trail couldn’t have been more hilly. We got to a point where we must have been at least 350 feet above the river with a significant part of the trail covered with beach sand that we had to slog through. Then, there was the downward ramp that brought us all the way back down to 2480 feet again. Although it is not listed in the hiking guides, these hills do add a lot more overall climb to the trail. So, although it is only 1400 feet or so from Bright Angel Campground to Indian Gardens, we are actually climbing up and down over 200 vertical feet of elevation. 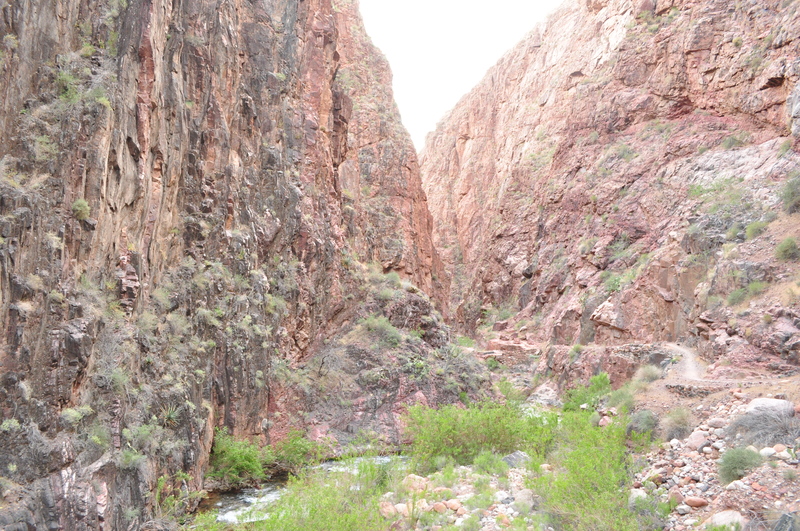 This complete lack of displacement between Phantom Ranch and the River Resthouse reminded me about my college physics class where I learned that regardless of the force given, if there is no displacement between the two endpoints, then zero work is done. Meaning, since I ended up at the same elevation that I started with, I didn’t do a single bit of work over the past 1.5 miles! The simple equation that calculates this is W = Fd (work = force x displacement). Maybe, but my legs and the hunger in my stomach were sure feeling it. After a few minutes resting here, we moved away from the river and into the canyon again. In fact, it was from this point that my party and I made the trip up to the rim back in 2005 following our white water rafting trip. So, I was now on the path that I had traveled before. Also, from this point, the trail does turn decidedly upwards and follows a little stream known as Pipe Creek. There is a lot of vegetation in this part of the trail: cottonwood trees, desert gooseberry, rabbitbrush, banana yucca, and a plethora of others that I could never identify. We quickly hit the part of the trail referred to as the Devil’s Corkscrew. This is an ominous series of steep switchbacks that zig zags its way up for several hundred feet. It is also an exposed area and gets quite hot from the direct heat of the sun. We were in this section around 4:30 in the afternoon and so it was very warm and probably wasn’t the best time of day to hit it. Another hour or so would have been much better. It is tiring to climb up this section, but there are several areas that are good for a rest point to have some water and take in the sights. 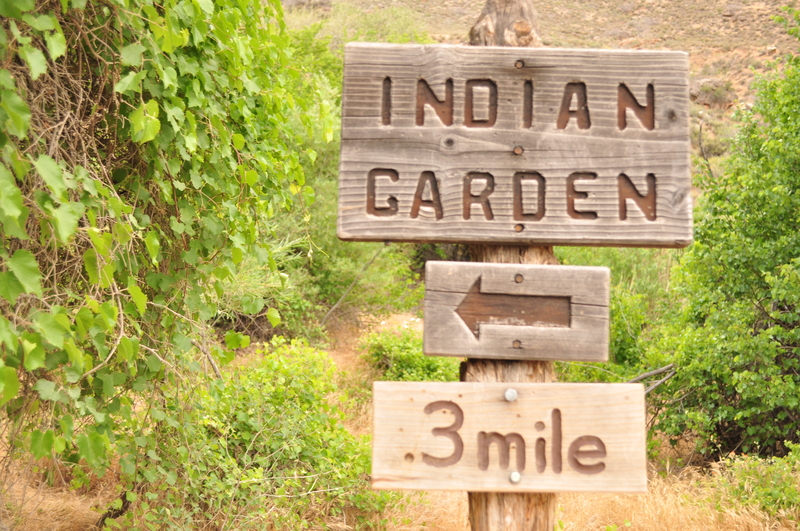 By the time we approached to within a mile of the Indian Gardens, the trail leveled out a lot more and it was relatively easy going, with the only major issue being the heat. But by 6:15 PM, we had arrived at the campground. Many of the camping spots were filled, but since we did have our back country permit for this trek, we were guaranteed a spot. Sure enough, there was a pretty good spot right smack in the middle of the overnight camping area. 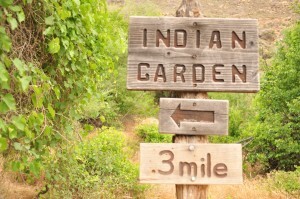 Although the Indian Gardens campground is just as simple as the Bright Angel and Cottonwood campgrounds, I did think that it was the best of the three. There is a wooden shelter built over the picnic tables for shade and the ground to place our tent was also very level with very few rocks. 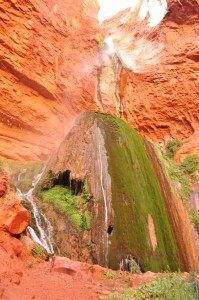 Because of our late arrival, we decided not to take the hike out to Plateau Point, which was another 1.5 miles out. Plus, by this time a large number of clouds had moved over us, blocking out the sun, and thereby eliminating the chances of seeing a nice sunset. So, we instead brought out our cooking gear and had our biggest meal yet of the trip with another bag of Pad Thai and Yakisoba Noodles. For dessert, we busted out with Raspberry Crumble from Mountain House. The Pad Thai and Raspberry Crumble were very good, but the noodles was a bust. It just didn’t taste very good, and so we each had a little bit of it, and packed up the rest to take up to the rim and dispose of up there. It was close to 8:30 PM by the time we cleaned up and had everything ready. The wind had picked up significantly and we could tell it would be a cold night. It’s amazing how much of a difference 1400 feet in elevation could do since it was quite warm the whole night through at Bright Angel Campground the day before. By 9 PM, we were in our tent and ready to sleep. Tomorrow we would be getting out of the canyon and heading home. 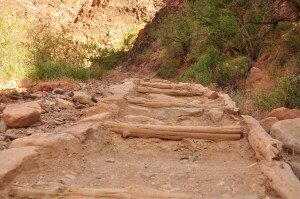 Only another 4.6 miles of the most heavily trafficked trail in the Grand Canyon to go. An interesting thing occurs when sleeping in a remote area of a canyon, especially when a heavily used trail runs right by your campsite — one is able to hear voices from miles away. 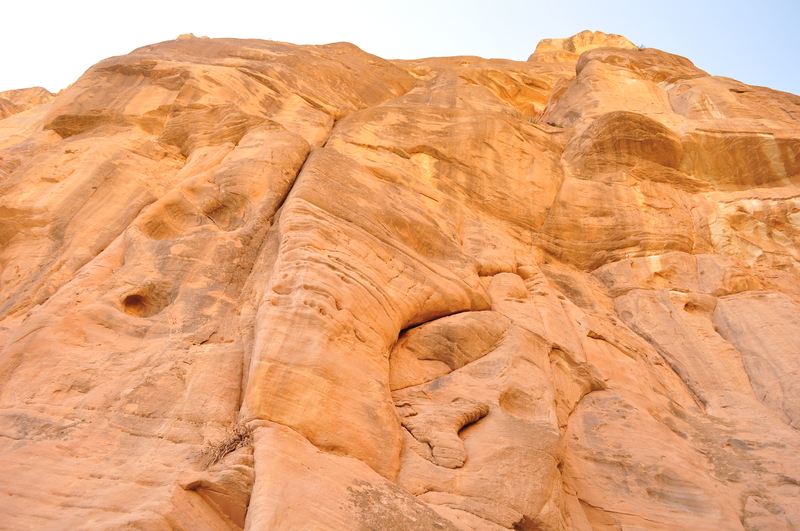 There is an amplification of sound that finds its way up the canyon walls and into your ear. This very thing occurred somewhere around 1 AM when I first heard a distant sound of hikers coming up the North Kaibab trail. Over the next 50 minutes, their voices got louder as this group made their way up the switchbacks in the cold, midnight darkness of the north canyon. Even when it felt like they were no more than a few yards away from me and I could make out every word they were saying, it still took another ten minutes before they passed within a couple yards of the tent and stopped for a water refill and bathroom break. This group must have been one of those speed hikers that go from one rim to another within a 24 hour span with only a Camelbak and some protein bars to keep their loads as light as possible. 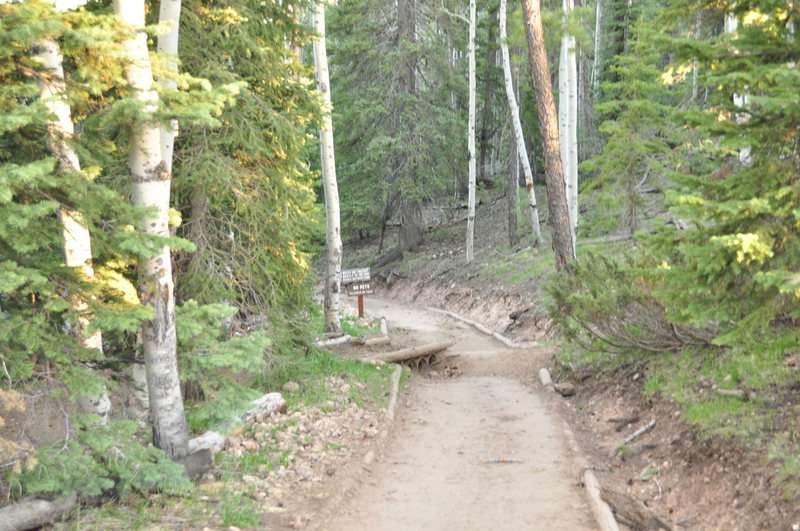 Around 4:30 in the morning, more hikers began to come down the North Kaibab trail, including a few runners. We decided this was a good time to get up as we didn’t want to be caught in the early morning rush of hikers making their way to Cottonwood Camp, or wherever their destination was to take them on this day. So after packing up our sleeping gear and tent, brushing our teeth at the water fountain, and getting our bags back on, we pushed ahead to a pretty long day of hiking ahead of us – in fact, it would be the longest of our entire trip through the canyon. Almost immediately, we came upon the Supai Tunnel, which is really no more than a man made tunnel blasted out of the canyon rock. Beyond that was the real prize: a look down the steep ravine of the Bright Angel Canyon, which we would be following all the way out to the Colorado River on the other side of Phantom Ranch. Standing here, we could also just make out the sounds of Roaring Springs as it gushed out of a large hole 1580 feet below us. We got started just after 5:30 in the morning, and despite the fact that the sun’s rays were still skimming the canyon rims, we quickly began to get warm. But despite the weights of our bags, we were making pretty good progress down the trail to a lower elevation. We stopped around 7 for a quick breakfast of bars and electrolytes, as well as several other brief stops for photo opportunities. And speaking of pictures, I lugged my rather heavy Nikon D90 DSLR camera on this trek. I was debating with myself at home whether a large camera body, a wide angle lens, and a zoom lens would be worthwhile to take with me, adding another six pounds of weight, or just pack a small point and shoot. At the end of this debate, I figured I would drag the extra weight around since I probably wouldn’t have a chance at doing this again. Besides, after using my DSLR for some time now, a point-and-shoot doesn’t even seem like a real camera to me anymore. So with my camera hanging from my neck, we continued our way over the next couple of hours until we reached a fork in the trail. The right trail continued on down to Cottonwood Campground, our destination for this morning, whereas left trail took a side trip to the Roaring Springs. 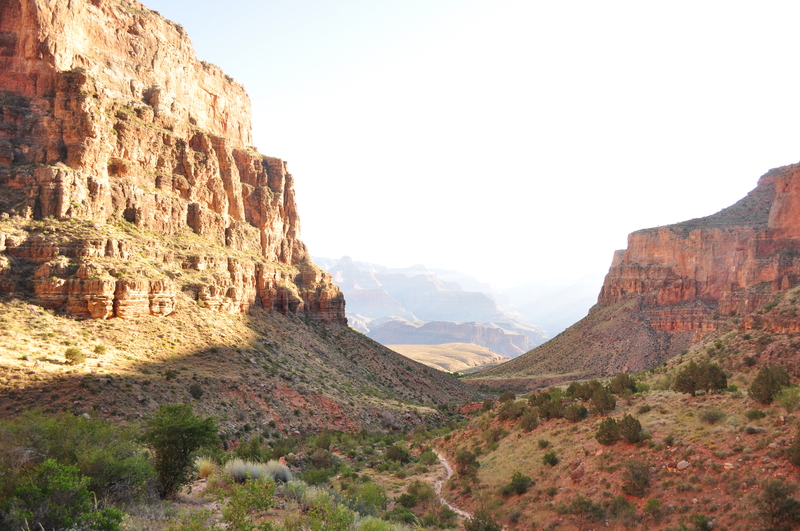 By this time, the sunlight had clearly made its way down into the canyon and it was starting to heat up. 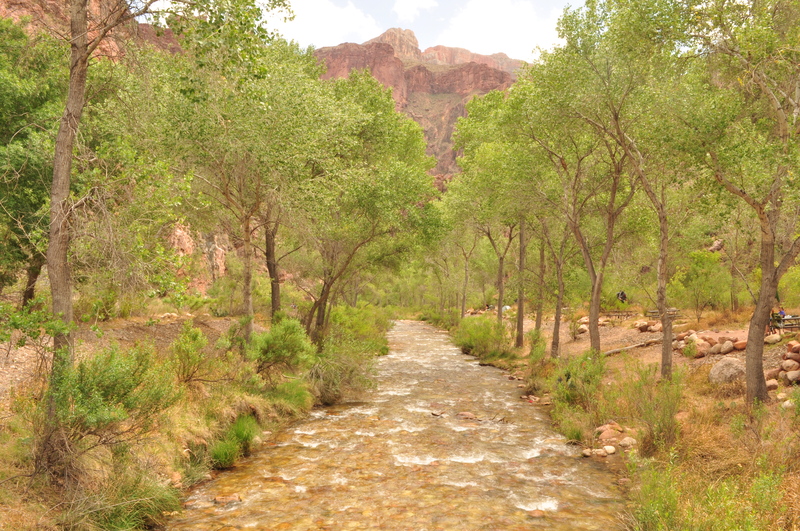 So, as nice as a side trip may have been to see this deluge of water that feeds the Bright Angel Creek tributary as it makes its way to the Colorado River, we decided to stick to the main trail and continue to the campground. But, I did snap a few pictures of it, as you can see below. 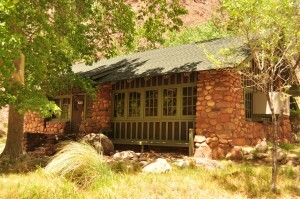 About three-quarters of a mile past the Roaring Springs turnoff, there a small house called the Pumphouse Residence. 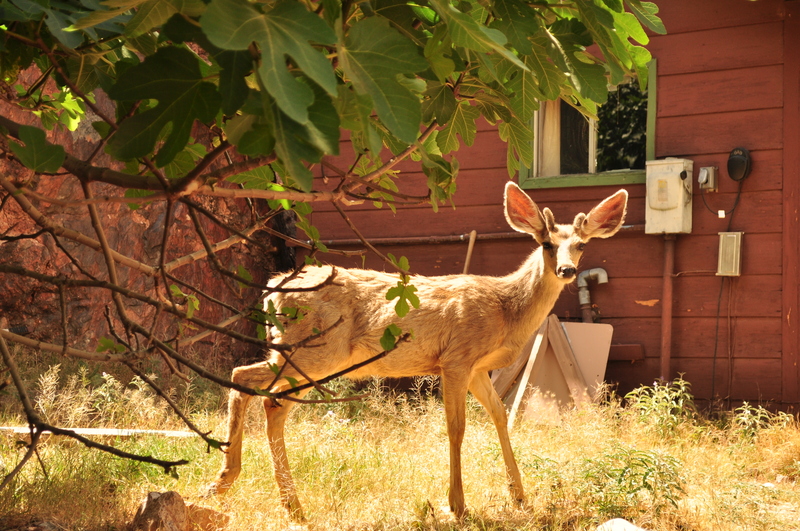 This was a private home where a Grand Canyon park employee and artist named Bruce Aiken lived with his family and painted there for many decades. Passing it, I couldn’t tell if anyone lived there now, but it does seem to be in pretty good repair. By this point on the trail, most of the steep downhill terrain had leveled off, and there were now a series of some rolling hills for the final 1.4 miles to Cottonwood Camp. Along the way, and even further up the trail, we had crossed the Bright Angel Creek several times over the constructed foot-bridges, which are also nice areas to stop at for photo opportunities. We arrived at Cottonwood Campground just after 9 AM – a total of 5.1 miles of hiking in about three and a half hours. 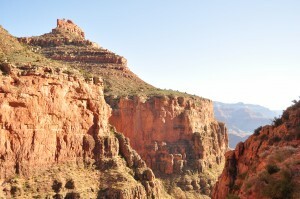 By this time, the sun was blazing down into the canyon and the temperature was in the mid 90s and extremely dry. We found a campsite here with some shade and dropped our bags. After resting for about 30 minutes, I pulled out the cooking gear and stove and made some huevo rancheros from our Backcountry Pantry selection of food that we brought with us. As is usual with eating in the wild, the food was actually quite good, and despite the heat of the day, a hot meal did help to energize us. We decided to stay here for a while before pushing on to Bright Angel Campground. Several hours later, we began seeing several of the hikers and backpackers who were shuttled to the North Rim with us the day before. 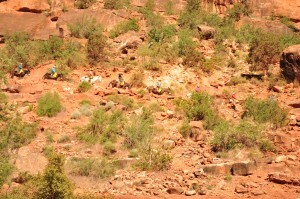 These folks had started the trail that morning and would be staying here at Cottonwood for the night. One group of six backpackers from Texas walked into the campground we were in and asked if they could hang with us. Since we were not going to be staying here for the night anyway, we were happy to have them come in. We spent some time hanging out and talking to them and found out that they would be hiking out on Tuesday, or a day after us. Around 2 PM, we cooked another meal of Pad Thai, filled up our water reservoirs, dunked our hats and bandannas in cold water to keep us cool (at least as much as possible), and headed out. In addition to the 7.2 miles we had to hike to reach Bright Angel Campground, we also wanted to take another detour to the much lauded Ribbon Falls. It only took us about 45 minutes to travel the 1.6 miles from Cottonwood camp to reach the trail head for the falls. 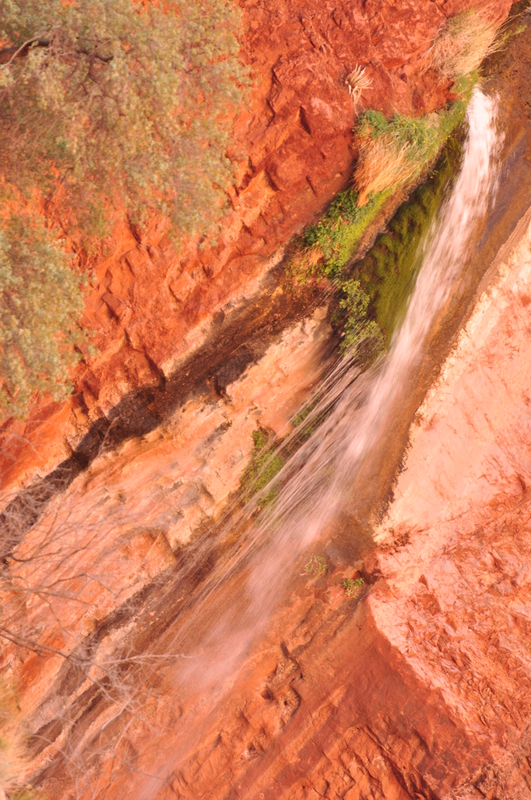 Unlike Roaring Springs, there is no way to see Ribbon Falls from this point, and one has to go down the trial, over the bridge crossing the Bright Angel Creek, and around a few hills to see the falls. 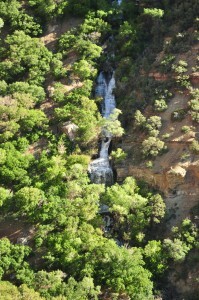 This adds over a mile to the overall length of the journey, but it is very well worthwhile to see the waterfall. It really is quite striking and an excellent respite from the heat of the canyon. One can actually climb the natural stairs and walk behind the ribbon falls for a pretty awesome view of this part of the canyon from this unique point of view as the wall of water crashes down onto a moss covered rock just yards in front of you. Moving on from this point, we got back onto the main trail again and found that we actually had to go uphill for several hundred yards on a pretty steep trail. This was pretty annoying considering that the Bright Angel Campground is 1400 feet below Cottonwood Camp, and so we were hoping for a smooth, easy walk over the course of this trail. Oh well – such is life, I suppose. But fortunately, it levels off quickly and the trail gets back to rolling hills with each successive hill lower than the last. For a while, the terrain here is quite nice. Lots of vegetation, cacti, flowers, trees, and other desert flora. The canyon walls are also pretty far apart for the first couple of miles. But then, there is THE BOX! What’s the BOX? This is the last part of the North Kaibab trail that ends at Phantom Ranch. It is the inner gorge of the Bright Angel Canyon – a narrow canyon within the canyon that is no more than a couple of hundreds yards wide that hugs the 1.7 billion year old Vishnu Schist and tends to go on and on. The issue here with the Box is not physical exertion, as the terrain is fairly flat and slightly downhill as you head towards the Colorado River. Instead, there is the very real danger of hitting this area at the wrong time of the day. The closeness of the sheer canyon walls and low elevation makes this the hottest part of the trail. The ranger we met at Cottonwood Camp told us that it can get up to 140 degrees Fahrenheit during the mid day from June through August. Rescue missions have to be made on foot, and usually the victim is just put into the adjoining Bright Angel Creek that runs next to the trail until the sun begins to set and moving a person becomes much easier. The second issue with this area is the slight claustrophobia, in that it doesn’t ever seem to end. With enough twists and turns and bridges to cross over the creek a half a dozen times, the Box seems to go on and on. However, this is a beautiful hike, and if done in the early morning hours, it is a very nice walk. Not to beat a dead horse, but our enthrallment with this area quickly ended as the weight of our bags started getting to us, and we had already hiked 10 miles over since the early morning when we began our journey. As a result of this, I didn’t take as many pictures of this area as I should have. The setting sun really did bring out a lot of the colors in the rock and would have come out pretty good. But we did eventually make our destination, and just past 8:45 PM we entered Phantom Ranch. It was a great relief to walk into this small oasis. A short quarter of a mile past the canteen brought us to Bright Angel Campground which was our stopping point for the night. We actually stopped off at the very first campsite just past the bridge and set up our tent, had some protein bars, and fell asleep by 10 PM. 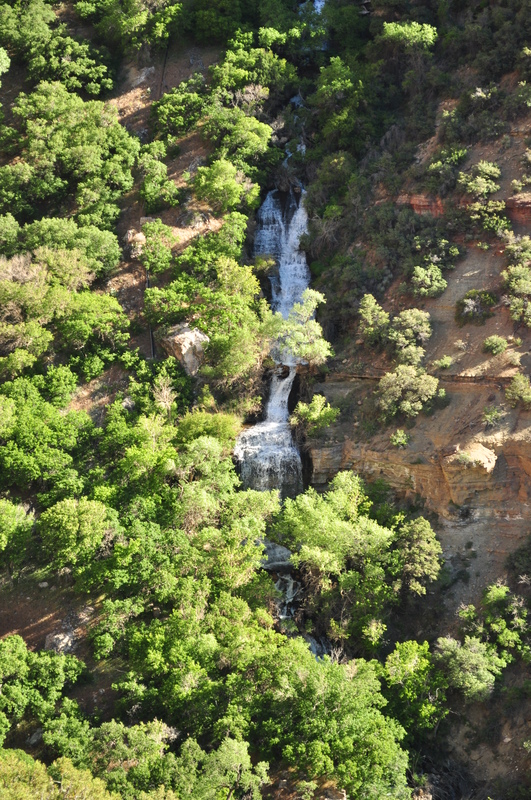 The total distance for today was roughly 13.5 miles, including the detour to Ribbon Falls. In terms of elevation, this would be the lowest point of our rim to rim hike at 2480 feet above sea level. 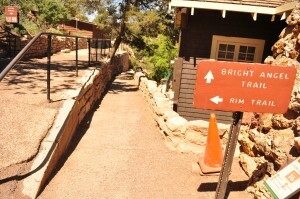 From here on, we would be heading uphill to the South Rim at 6860 feet and another 9.6 miles up the Bright Angel Trail. There are superheroes in the world! Not the kind where you think that your mom or dad is your hero, or the fireman you read about that rescued a family from a burning building; but actual real superheroes with powers greater than most mortals. As it turns out, these super-beings aren’t on the front page of magazines and newspapers, nor do they grace the pages of comic books or are the subjects of summer blockbuster movies. This revelation came to me a number of years ago as I was hiking up the Marangu Route on Mount Kilimanjaro in Tanzania. We were supported by a team of porters who were regularly carrying loads of up to 50 or 60 pounds up and down the slopes of the 19,340 foot elevation of the mountain – and they were doing with the speed and agility of bus boys at a high end hotel chain. Though impressive, Kili is nowhere close to being in the upper echelon of mountain summits. The 8,000+ meter peaks of the Himalayas where the sherpas perform the same types of tasks as my porters in Tanzania did is truly a Herculean feat. In fact, the oxygen level is so low here that most people would pass out after a short walk on level surface without first spending days acclimatizing at lower elevations. At sea level, oxygen is about 20.9% of the air we breath. By the time we reach 7,000 feet, that level has reduced to 16%. At Kilimanjaro, I was trying to breath in air that only made up 10.1% of air, or less than half of the oxygen at sea level. By the time the Himalayan climbers get over the 8,000 meter (26,246 feet), that has dropped further to around 7.5%. Here is a handy chart to see the drop over elevation. I was thinking about these porters and sherpas while climbing my own way out of the Grand Canyon along the Bright Angel trail with a 45 pound backpack strapped on. It wasn’t the climb that was particularly difficult, despite the steep grade and the relatively warm temperature of late May. Rather, it was the constant strain and repositioning of the loaded pack that drifted my thoughts to superheroes and the sherpas that substitute for them in our real world. It was a good distraction, in that it made me feel that I actually had it pretty easy in comparison and was only climbing to about 6800 feet above sea level. So, what led me to all of this huffing and puffing to begin with? Let’s go back a little ways to the inception of this trip. Back in September of 2005, I went on a rafting trip down the eastern half of the Colorado River. Over the course of 6 days, our party rafted 90 miles from Lee’s Ferry to a mile past the Phantom Ranch lodge to a point called the River Resthouse. From here, we piled out of the rafts and hiked 8 miles up the Bright Angel trail to the South Rim of the Grand Canyon to conclude our trip. The hike was a nice way to end the trip, and it wasn’t too bad of a climb out, especially since I was carrying maybe 7 pounds in my backpack and most of that was a diminishing supply of water and sandwiches. After reaching the top in just over 6 hours from the river, and feeling pretty good about myself, I figured that the next step would be to do the full monty and tackle the quintessential Rim-to-Rim hike. Now, almost six years later, I found myself standing at the entrance to the North Kaibab Trail at an elevation of 8241 feet above sea level. The shuttle had just dropped us off after a five hour drive from the Bright Angel Lodge on the South Rim. This was the last mode of transportation required to get us to the starting point of this trip. The journey actually started 12 hours earlier as I took an early morning flight out of San Jose, CA to Phoenix, Arizona. From there, an exceedingly long flight of 24 minutes on a puddle jumper took us up to Flagstaff. It was one of those few times in my life where the time spent taxiing on the runway was longer than the airplane ride itself. 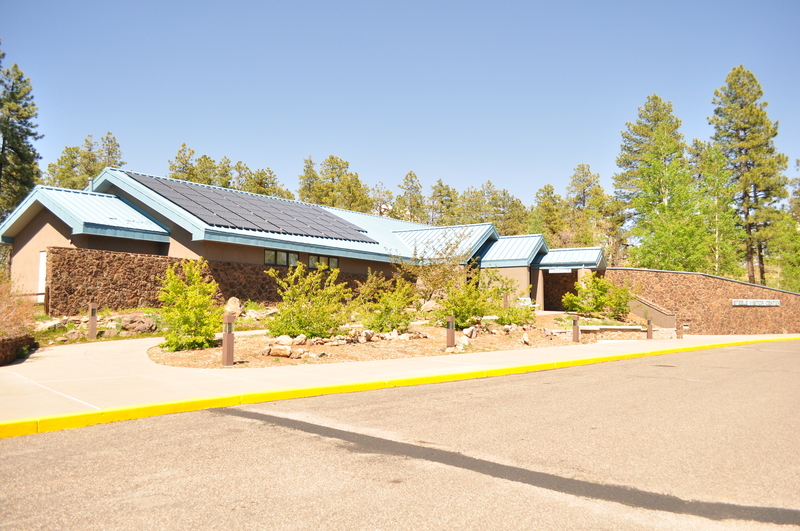 In any case, from Flagstaff, we rented a car and drove the 75 miles up to the South Rim of the Grand Canyon, stopping off along to way at a couple of places to find some fuel for my collapsible cooking stove. 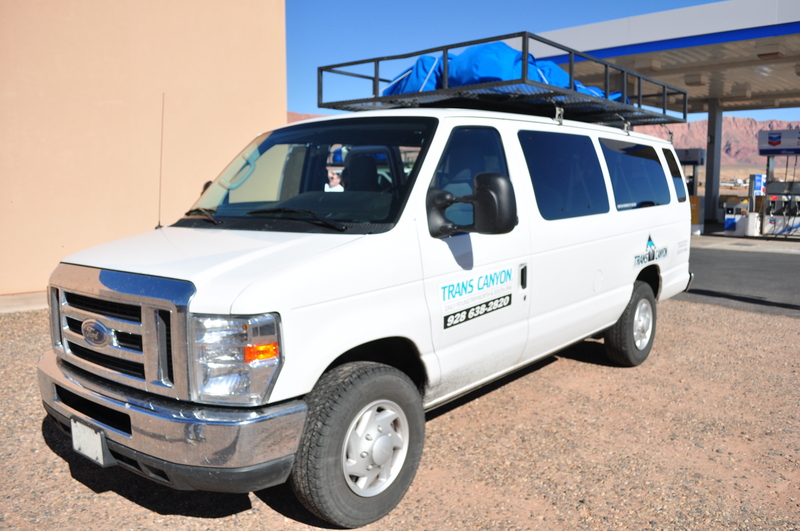 And finally, once at the South Rim, we had arranged for the Trans-Canyon Shuttle to make the 220 mile drive up to the North Rim. Needless to say, there is a lot of logistics involved in putting this together, which could be another reason why so few people actually do it. 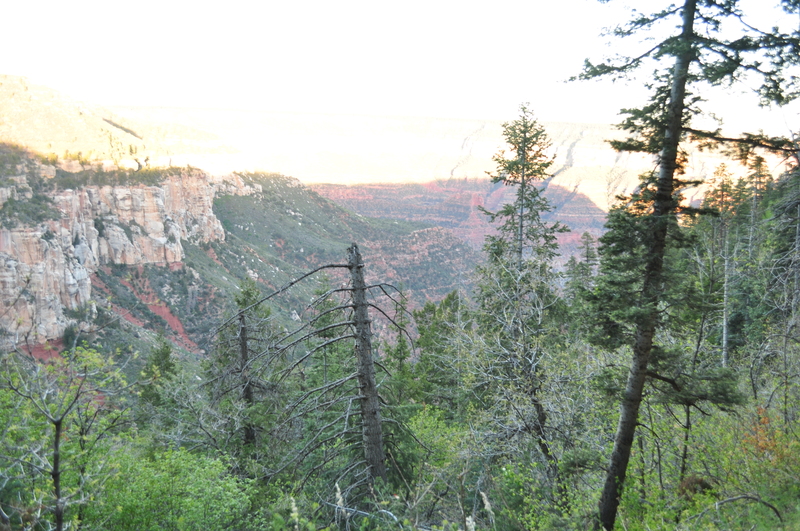 It was now just a bit before 7 PM, the spring sun was starting to wane, and the first trail campground was 6.8 miles, 4161 vertical feet, and billions of years of geological time below us. Despite a full convoy of about 50 travelers on the numerous shuttles, we were the only ones starting the journey tonight, which wasn’t a great omen. But throwing caution to the wind, as I usually like to do when death is on the line (just kidding), we started our decent down the steep switchbacks of the North Rim. 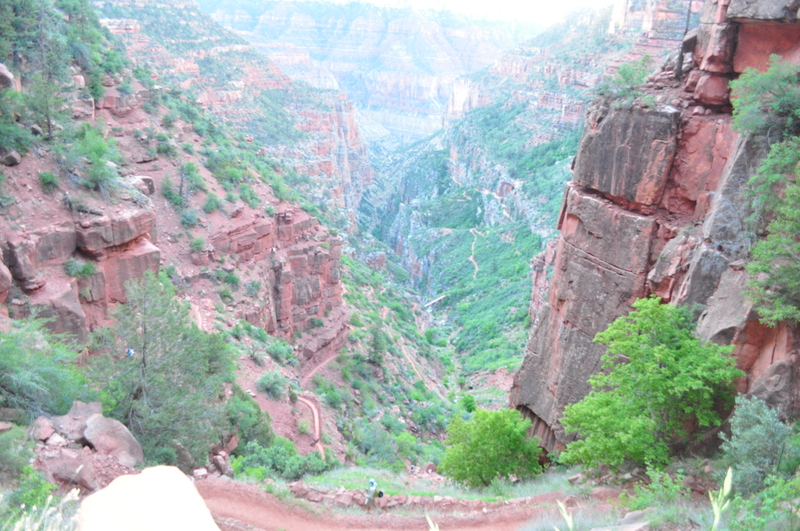 We were making pretty good time, but the further we descended, the less light was penetrating into the canyon. Between the steepness of the grade, the diminishing light, and the heavy loads on our backs, we managed to make it down to the first rest stop by around 8:15 PM. There was water as well as a restroom here and was really the first area we came across that was wider than just the trail we were on. So, we made a decision to camp here for the night, even though it wasn’t a formal camping spot. We unloaded our bags, set up the tent, had an energy bar, and turned it for the night by 9 PM. At this point, we were at an elevation of 6800 feet, and it’s amazing how quickly the temperature fell once darkness set in. A sleeping bag is essential at this altitude. The temperature dropped down to the mid 40’s in a couple of hours, but sleeping under the stars in such a remote area of the canyon was an excellent way to end this first day. So, with the exception of Adobe Flash support and better front and rear cameras than the iPad 2, the other major features are on par with the market leader. The other cool feature of the Playbook is the ability to show a high definition image on a connected screen, while doing a different task on the Playbook screen. However, the few advantages end there. Now would be a good time to get into the nitty gritty. Let’s begin by the biggest one. But it sure does look nice, doesn’t it? The Blackberry Playbook doesn’t provide email service unless it’s hooked up to a Blackberry phone. Huh?! A Blackberry mobile device that needs to be tethered to another Blackberry mobile device just to get RIM’s bread and butter service — enterprise software? You’ve got to be kidding me. Yes, the co-CEOs, Balsillie and Lazaridis, did say this service would come out later, but when you’ve got once chance to have a coming out gala and wow the tech world, why in the world would you exclude the most obvious use of a business focused device? So, why would RIM launch a product that’s missing its signature piece? The general concensus is that it didn’t want to delay its market launch. That seems like a pretty sour justification to me. Launching a product prematurely is much worse than being late to market, in my book. A well made product can make up lost sales by strong word of mouth and a solid grasp of features that the consumers want. What doesn’t work is a promise to provide basic features at some undetermined time and us the product with a crutch. As much as I have liked Blackberry products in the past, this would not be on my list of “must have” items coming out of the gate. The other issues about the Playbook is the size and retail price. It has a 7″ screen size putting in line with the Samsung Galaxy Tab. But it is smaller than the 9.7″ screen on the iPad/iPad 2. However, the starting price point is on par with the 16GB version of the iPad 2, at $499. What gives? Why enter a market with a smaller device, low app store choices, a lack of built-in email, and an inability to connect to mobile phone networks but still price it at the same entry price as the market leader? I think RIM really took a gamble here by releasing the Playbook as they did. We’ll see how it fares in the first quarter or two. I’m sure there will be the die hard Blackberry users that will be buying it and tethering it to their Blackberry phones, but I don’t think this current version will catch on as much as RIM would like to think it will. 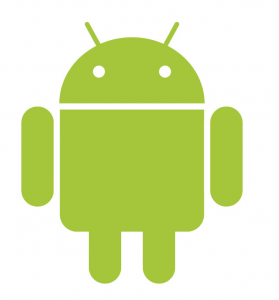 According to the technology research company, Gartner, the Android OS will be powering 49.2% of all smartphones by the end of 2012. 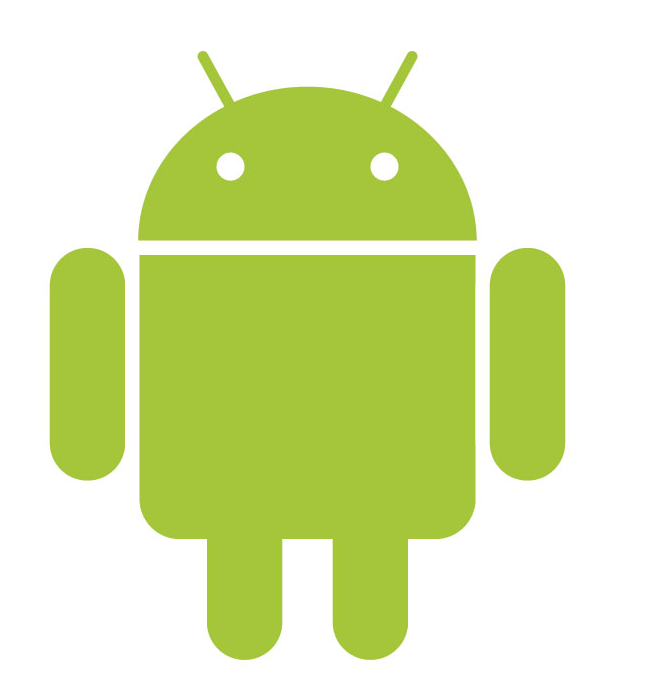 Manufacturers are expected to ship more than 630 million smartphone units in 2012, and the Android devices will account for about 310 million of those shipments. This is an interesting development, but not surprising. The first Android running mobile phone came out in October 2008 with the release of the HTC Dream, which was marketed at the T-Mobile G1 in the United States. Although over a million of these phones were sold over the life of the G1, the reviews of the phone itself were mixed from reviewers and users alike. However, the main driver of Android’s fast proliferation is the Open Handset Alliance, which is a consortium of 80 businesses led by Google, and includes software companies, semiconductor and handset manufacturers, and mobile operators. This momentum has allowed this alliance to compete against other mobile operating systems from the other heavyweights such as Apple, Research in Motion, Symbian, and Windows Mobile. The article goes on to say that Apple iOS will retain 2nd place with a distant 18.9% share, and will even take 3rd place by 2015, while Windows Mobile will rise to 19.5% with their recent partnership with the once dominant Nokia, who will be shuttering their Symbian OS.